The Addison Brushed Steel Stool Black will strongly appeal to your sophisticated side. This muted beauty rests on a flat weighted base, creating stable foundations from which the stool can flourish. Plus, its backless design is great for those seeking to save space. This comfortable piece is surrounded by a brushed steel rim, serving to enhance the Addison's ornate allure. 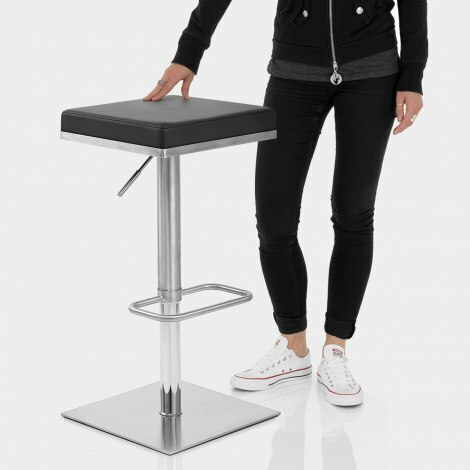 Meanwhile, the backless, soft faux leather seat pad creates a cushioned perch for your body, and invites you to sit comfortably at your counter or bar area. A brushed steel finish characterises this stylish height adjustable frame, and is achieved via a meticulous hand brushed effect. Further to this, a 360 degree swivel plate encourages you to rotate for increased ease-of-use. An oval-shaped footrest emerges from the central stem, supporting your feet. Finally, protective pads are located beneath the base in order to effectively minimise friction between the design and your surfaces. "I'm extremely pleased with the quality"
Love this stool! Stylish smart, comfortable and well made. Sits under the counter well & fits right into the corner with its square base. Stool is solid & heavy lift works very smoothly would definitely recommend. Arrived very promptly, well packaged, exactly as described. Would purchase from this company again. Perfect for my kitchen island, modern look, very sturdy and comfortable. Highly recommended! I bought these stools to go with the 'Le Monde' glass table I bought at the same time. The stools arrived well packaged and were very easy to assemble. The stools are very solid, comfortable, and go well with the glass table. The flooring in my kitchen is covered in a thick vynl which is prone to marking with normal chairs. The stools have caused no marking on the flooring so far. Very pleased.